You probably don’t want to see Eureka Seven Hi-Evolution if you’ve not seen the TV show. I mean, you may not want to see the movie even if you have seen the TV show, but it will at least hold some degree of merit under those circumstances. It’s difficult to see any real value for those without that prior experience, though. The new Eureka Seven movie is the first part of a trilogy that is recounting the story of the original Eureka Seven TV show, with some degree of additional material added into the mix, and in that fashion, the movie actually starts on extremely strong form – the opening of the movie shows, for the first time, the event known as The Summer of Love. It’s pretty spectacular, as well – not to sound like a broken record already, it’s an incredible opening in most senses of the word. Chief Director Kyoda Tomoki stated at the QA attached to the screening I attended that one of the things that lead to him wanting to work on this series of movies is that it’d give all those masters of 2D robot animation a chance to show off in an era when much of their work in being done in CG, and it certainly achieves that. Eureka is long known for it’s fast-paced sky-surfing robots, and the Summer of Love provides plenty opportunity for this, coupled with elaborate effects animation as the military commence operations against huge swarms of antibody Coralians. Cool surfing robots leaving elaborate glowing green vapour trails shooting off missiles and homing lasers and causing things to explode – what’s not to like about that? It’s equally impressive in what it does to the narrative of the Eureka Seven franchise as a whole – it centers around series-protagonist Renton Thurstons father, Adroc Thurston, who in the TV show is mostly only really known as a hero who helped save mankind from complete destruction. I don’t really want to spoil the specifics of it, but whilst the movie opens with the events with which Adroc is eventually known for, the specifics of what occurs serves significantly re-contextualise many of the events of the series, as, shock-horror, they may not be exactly as they came to be know. It’s, in all honesty, a terrific opening to the movie. Exciting, well-animated and interesting. It’s maybe the best Eureka Seven has ever actually been. The problem is with the other hour of the movie that follows it. Cutting years forward, the movie jumps straight into the middle of the series, from Adroc to Rentons other father figure, Charles Beam. Well, first it jumps to just before the end of that arc, and then it jumps to Charles. Which is kind of the problem, it jumps an awful lot. Basically, the movie takes what is probably the stand-out, most popular arc of the entire TV show – that is, the arc surrounding Renton being adopted by the Beams, Charles and Ray – and presents it in a fashion that is confusing even for someone familiar with the show, and probably entirely incoherent for someone who isn’t. Once the movie hits the present-time portion following Renton, it jumps almost immediately into flash back of a few hours before hand, and doesn’t really pick back up to that point until the end of the movie. 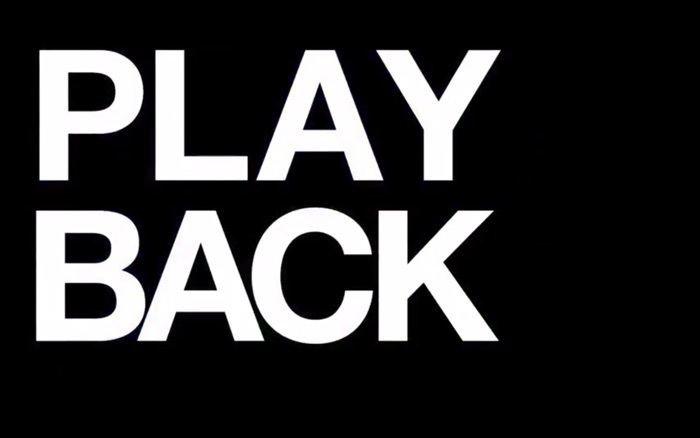 What really confuses matters is that it then flashes back from that flashback to several days beforehand, then to several hours later, then to several weeks beforehand, then a few days beforehand, then a few days later, then a few more… well, you get the idea – the terms “Play Back” and “Play Forward” appear splashed across the screen with more frequency than a splash card in a Monogatari episode, and at times the movie even has the cheek to flashback to scenes it’s already done flashbacks verbatim. It’s trying to split its narrative up in a non-linear fashion, but it’s not actually a story that needs or is well-suited to it. Get used to seeing this. A lot. What ends up being even more frustrating about this is that the movie fails to actually establish any of the context for why anything what is going on here matters. Maybe I missed it due to the thoroughly confusing structure, but I’m pretty sure the movie never actually covers the scenes of Renton meeting the Beams. It doesn’t actually cover the scenes of Renton meeting Eureka for that matter – it briefly touches on the existence of a couple of important events, but only those relating to Renton leaving the Gekko. 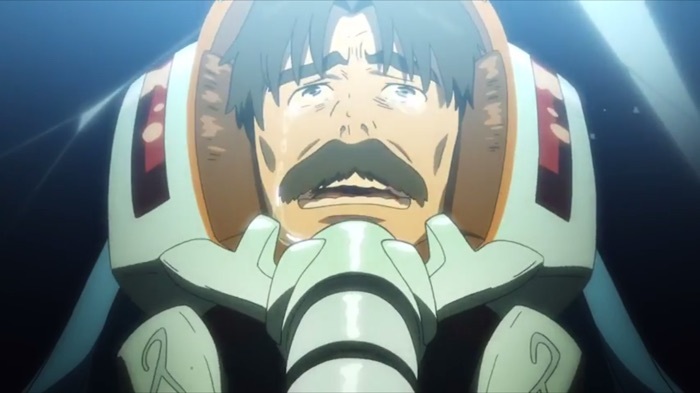 Eureka appears in the movie so little that an audience member unfamiliar with the franchise actually asked Kyodai why the series was even called Eureka Seven. It shows nothing of her and Rentons relationship, and little of anything relating Renton and his time with Gekko State. Essentially, the movie presents a confused story and provides none of the context required to understand it, why it matters, or why the characters act in the fashion they do. It’s drama rendered meaningless and without point. The audience simply isn’t made aware of why Renton even has conflicted feelings. In their attempts to hyper-focus on just Renton and his father figures, it fails to give you a reason to care about it. The majority of the later segment of the movie comprises of footage reused from the old TV show, presented in all it’s original 4:3 glory. It was a well-animated show as it was anyway, so it’s not like it looks particularly bad, but I do wonder how much of the whole flashback approach thing was actually to excuse the video framing. Honestly speaking, its rather remarkable how much they managed to miss the mark on this movie, though. You’d think that there’s only so much they could do to bungle a recap of a pretty decent TV show, to the point where I didn’t put too much weight into some of the complaints I’d heard coming out of the screening at Otakon. It turns out that I probably should have listened and adjusted expectations accordingly. I’m having to presume, at this point, that the intention with these movies is maybe less to do with presenting a retelling of the show, but to retell or show in a different light three very specific stories from it. Presumably the next movie will be doing something revealing about it’s poster-girl Anemone (it’s certainly doing something with her, anyway), but if it’s handled as cack-handedly as this was, it’s hard to be excited unless we learn it’s predominantly new footage. That said, on that note, there is one thing outside of the opening that movie handles surprisingly well, as weird as it is. There’s a blink-and-you’ll-miss-it reveal in the preview for the next movie that is very subtly hinted at throughout this instalment by way of minor alterations to the background art of the reused footage that you may only pick up on if you are already aware of it. It’s something done shockingly deftly in a movie full of confusing choices. Ultimately, though, that first half hour really is amazing. Maybe it’s actually worth seeing the movie just for that. That probably depends on how interested you are in animation or in Eureka Seven in general, I guess.